When I was pregnant with my daughter seven years ago, our family received devastating news. My beloved 20 year old niece had passed away unexpectedly and it changed our lives forever. While my sister and her husband will never be the same after the tragic loss of their only child, as a mother it is hard for me to imagine how they have gone through this experience without becoming bitter, especially towards God when we begged Him to spare her life. Instead, my sister is an inspiration to me as she draws upon her faith to get her through day by day. Therefore, I was very interested in viewing the new documentary by Kirk Cameron. 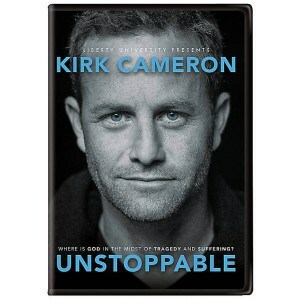 UNSTOPPABLE was inspired when his close friend passed away after battling cancer at the age of 15. Tackling one of the most difficult topics in faith, “Where is God in the midst of tragedy and suffering?” this amazing documentary is a beautiful visual journey that is aimed to help those find hope and middle in the face of tragedy. This family oriented feature is thought provoking, inspiring, affirms the importance of faith in our lives especially during difficult times. UNSTOPPABLE brought me back to the times in my life that I have experienced or witnessed pain and suffering. To be honest, there have indeed been times that I have been angry with God and wondered how He could possibly allow horrific events to happen every day in the world. Kirk Cameron investigates how both good and evil impact every aspect of our lives and he has an open, honest discussion about God, suffering and hope. I have nothing but admiration for the path that Kirk Cameron has taken in his life following his cultural icon status in the 80’s……I grew up watching him play “Mike Seaver” on Growing Pains and loved his acting. Instead of simply being satisfied with his success he has continued to grow in his faith and has made some of my favorite movies such as Fireproof in 2008. I have even more respect for his honest, raw look at tragedy, suffering and doubt in his own personal life after watching UNSTOPPABLE. If you or someone you love has been suffering, feels the pain of loss or is questioning their faith due to things that happen in this world, then I highly recommend watching UNSTOPPABLE. It is available for purchase on DVD for the SRP of $15.99 at retailers such as FamilyChristian.com and Amazon.